A terrific story by Mick Sharkie of G1X about how central Victoria’s Ridgeview Park has come up trumps with a very cheap broodmare buy. When Junee based abattoir owner Heath Newton approached bloodstock agent Sheamus Mills to take over the management of his thoroughbred portfolio 18 months ago, the pair agreed to treat the stock list with the same ruthless approach as the coach of an underperforming football team. Newton had too much under performing stock and it was eating into his budget – he needed to cut the has-beens and bring in some new talent. “It’s certainly not uncommon amongst hobby breeders,” said Mills. 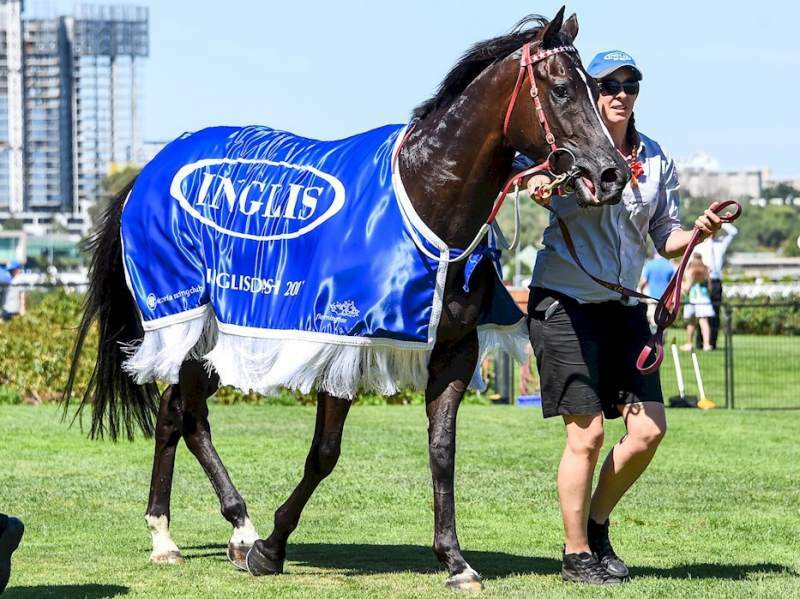 Under Mills’ management, 11 racehorses were sold unreserved through a tried horse auction, with five broodmares dispatched to the Inglis Easter Broodmare Sale, also unreserved. The only horse that carried a price at the sales was Secord, an ageing Encosta De Lago mare in foal to I Am Invincible. It wasn’t that she was any better than the other mares that Mills had sold off, the agent was merely conscious that his client had forked out $27,500 for a service fee and so he didn’t want to torch that investment. Secord went back to Widden Stud and duly produced a colt, a very good colt in fact. The Secord colt was accepted into the 2017 Magic Millions Gold Coast sale and, according to the Thoroughworks tracking technology, had more inspections than any of the 1000-odd horses on the complex, eventually selling to Shadwell Australia for a whopping $600,000. “I would have been in the foetal position if we’d sold the mare and someone else took that colt to the sales, but boy, we did everything we could to get rid of her,” said Mills. “Last Thursday when he went through the ring I just thought, I’m the luckiest bloke in the joint. My client thinks I’m a genius and we’ve just had a huge result, but it was anything but good planning. So what became of Secord, the mare that no one wanted? “After she was confirmed in foal to Star Witness we put her on the market and we got – wait for it – $1600. Ridgeview Park in Victoria bought her,” Mills said. “And how good is that? Heath is not the only winner from the story. Phil and Fiona Sloane at Ridgeview are absolutely thrilled they managed to pick up such a steal. ‘We attended the Gold Coast National Broodmare Sale last year and we couldn’t believe it when we acquired her for that price, we were pinching ourselves really!” Fiona said. “Not only did she have a great pedigree she is a city winner amassing over $37,000 in earnings and she was also in foal to Star Witness! ‘She settled nicely when back here at Muskerry East and had a beautiful Star Witness filly in September. “Secord is back in foal to Reward For Effort, little does she know how precious she is!” Fiona said. “It’s a great result for a mare that no one wanted,” Mills commented on the full list of transactions. 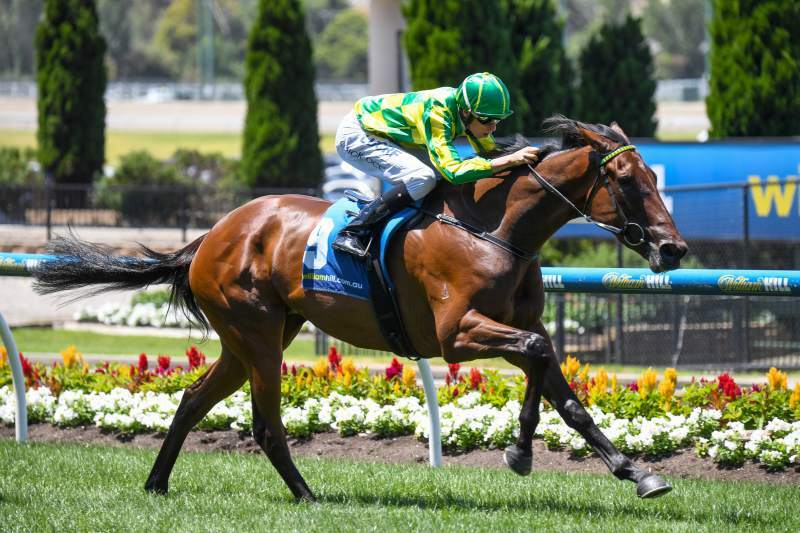 Dual Group 1 winner Malaguerra demonstrated his absolute class in rounding up the field around the home bend and dominantly winning the Group 2 Australia Stakes (1200m) at Moonee Valley. 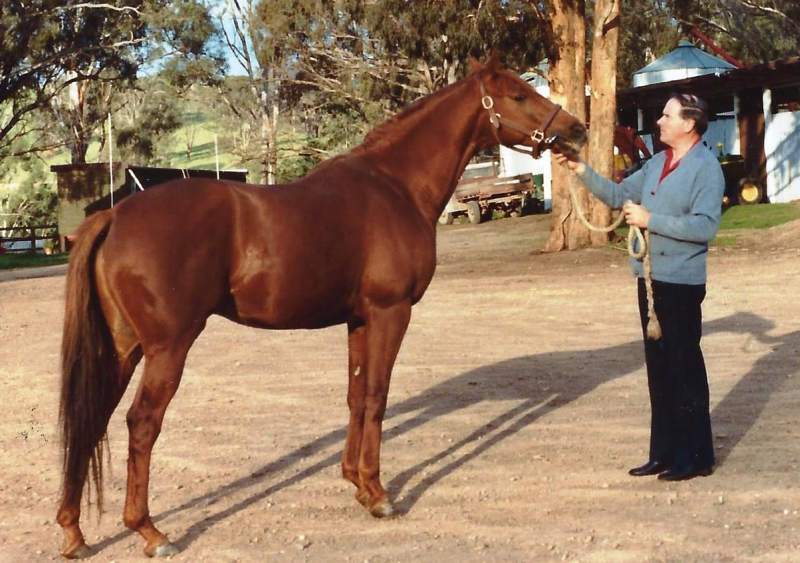 The five year-old son of Magnus was bred by the Sandown Lodge partnership of Lyn Armanasco and John Dickson and was foaled and raised at Pakenham South’s Ballarto Lodge. Lyn (daughter of the great trainer Angus) and John (son of Alf) inherited Sandown Lodge from their respective parents. Lyn says Malaguerra is the best they have bred since taking the operation over. “The dads would be smiling at us,” Lyn said when talking about Malaguerra’s success. Ridden by Ben Melham, the Peter Gelagotis-trained gelding camped on the early speed set by Sirbible (God’s Own) before taking control in the straight and winning by two lengths. Winner of the Group 1 Darley Classic at Flemington last November, Malaguerra equalled Miss Andretti’s track record of 1:09.29. “Moonee Valley can be tricky, but the horse showed a lot of class,” said Gelagotis. “In our mind, he was clearly the best horse in the race. He’s a multiple Group 1 winner. The Sandown Lodge product will now be aimed at the Group 1 Orr Stakes and Group 1 Futurity Stakes at Caulfield in February. That could only be described as a steal considering Malaguerra earnings now exceed $1.5 million! The victory propelled Sun Stud sire Magnus into the Top 20 of Australian sires by earnings. He is the 16th foal of the stakes-winning Bletchingly mare Tennessee Morn whose previous best had been the Listed stakes-winner Tennessee Midnight (Danehill), the dam of Group 1 Coolmore Classic winner Aloha (Encosta de Lago). Tennessee Morn’s final foal, before she died in March last year, is the four year old Wanted colt Tennessee Outlaw. Coincidentally, he became his dam’s 11th winner when capturing a maiden at Darwin at his second start on Australia Day. Lyn Armanasco said the success of Malaguerra had resulted in a number of inquiries to herself and John about what Sandown Lodge has on offer this year at the sales. John and Lyn are thrilled with such inquiries as Sandown Lodge yearlings are being offered in four different sales across two different states. 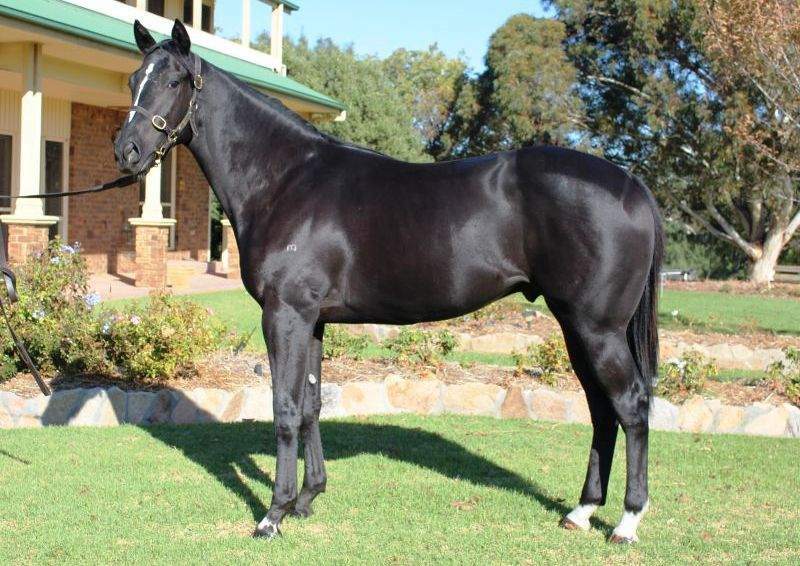 This includes a Stratum colt out of stakes placed Enzed Girl, a member of the ‘Malaguerra family’. He will be sold through the Swettenham Stud draft at the Inglis Melbourne Prmier Yearling sale. Limestone delivers for the lime, purple and gold! Dashing grey Helmet filly Limestone made headlines when defeating Black Caviar’s first born Oscietra on January 1 and showed her class with a fast finishing win in the Group 3 Blue Diamond Preview at Caulfield on Australia Day. The filly is a homebred for Hesket Bloodstock, the breeding operation of David & Jenny Moodie in association with Ashley Hardwick. Jenny Moodie said Limestone’s trainer Darren Weir quite liked her as a two-year-old. “She has surprised us a little but was always a nice enough filly,” Moodie said. Weir is not renowned for his training of two year-olds, so Limestone is breaking new ground for the leading trainer. “I’ve never had a two year-old like her before. I’ll have to have a think about where we go next, although maybe another run before the Blue Diamond,” Weir said. Interestingly, Limestone clocked 56.88 seconds, which was slightly quicker than the colts division won by Property (Starcraft). Limestone is the second foal and second winner from Limerock, a winning Charge Forward half-sister to stakes-winner Warpath. Limestone’s three-year-old sibling Gimlet (Dream Ahead) won last year’s $100,000 VOBIS Gold Strike as a two-year-old. Limestone is the third stakes-winner for Darley’s triple Group I winner Helmet, who has a big draft of 23 yearlings for the upcoming 2017 Inglis Premier Yearling Sale. Helmet is now fourth on the Australian Second Season Sires Premiership by earnings with a number of promising two and three year olds popping up over recent weeks. Bendigo-based TBV Member Rod Symons has forwarded the above video developed by his equine veterinarian brother Dr Peter Symons. Rushton Park’s pedigree update of the sale! Volpe Veloce (black colours) wins the Karaka 3YO Mile (NZ Racing Desk). If there is an award for best pedigree update for this year’s Inglis Melbourne Premier Yearling sale, then Murchison’s Rushton Park already have one hand on the trophy! On Sunday, Australian-bred, Volpe Veloce (Foxwedge) won the lucrative NZ$500,000 Listed Karaka 3YO Mile at Ellerslie. The filly found that extra gear in the last fifty metres to edge out Heroic Valour (Fastnet Rock) – another Australian-bred – in an absolute thriller. The win maintains the filly’s unblemished record of seven wins from seven starts including four black type wins. Willing her home were David and Kayley Johnson at Rushton Park as they have her full sister for sale at the Inglis Premier Sale starting later next month. John Jeffs, who is the ‘meet and greet’ for a number of vendors at major sales, will be helming the 2017 Melbourne Premier Yearling Sale draft for Rushton Park and was quick to laud the Johnson’s purchasing prowess. “David and Kayley (Johnson) are the proud owners of Bardego, the dam of Volpe Veloce,” Jeffs points out. 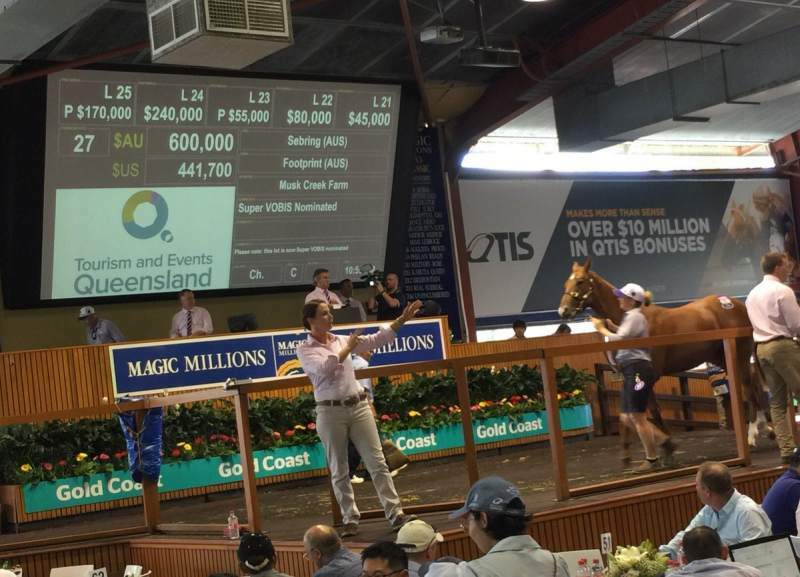 The Johnsons bought Bardego at the 2015 Magic Millions National Broodmare Sale for $46,000. “They’ll be selling this full sister to Volpe Veloce at the 2017 Inglis Melbourne Premier next month and Bardego will be booked into Foxwedge again this coming spring. “The Johnsons are salt of the earth … no airs and graces, just know their horses and love them accordingly. Full details of the Rushton Park yearling. “Volpe Veloce is increasing the family’s value and her younger sister is built in the same mould. Bardego has a Helmet filly on the ground and we decided to give her a year off this season,” said Kayley last month. Rushton Park has 20 yearlings catalogued for the 2017 Melbourne Premier and, besides the Foxwedge filly, Kayley’s other highlights are the Snitzel – Bright Heart colt (Lot 393) and Medaglia d’Oro – Celsius filly (Lot 407). The north-west quarter of Victoria was a big winner at Flemington last Saturday with Perpetual Crisis scoring in the richest race of the day, the $250,000 Inglis Dash. The three-year-old was bred by Warracknabeal’s Ray Campling and Helen Brindle and raised by the McKnight family at their Oakford Thoroughbred Farm near Maldon. He is a son of Stryker, based at Three Bridges in Eddington not far from Oakford. Brian McKnight tells the galloper’s story which almost didn’t make it past day one of his life. “It’s a phenomenal story of this horse. He was born four to five weeks prem, he came out a July foal, and he was very, very lucky to survive those first couple of weeks,’’ McKnight says. “Somehow, he got through it and survived, he fought all the way when some of us thought he might not make it, but he did, just exactly like he did in that race today, he fought ’til the end when plenty thought he was going to get run down. “We raised him and looked after him on the farm until the yearling sale and after surviving that big scare at the start of his life, he really did become the King of the Kids on the farm. And then there’s the story of Perpetual Crisis’ mother, Leica Gossip. Ray Campling says he and Helen bought her in New Zealand as a yearling to race but an early vet check put paid to that racing career. The filly was found to be blind in one eye and so was unable to take to the track. The unfortunate discovery however did allow them to add her to their small broodmare band on their twenty acre property just outside of Warracknabeal. As a three-year-old she foaled down at Bullarook Park Stud in Avenel and produced Perpetual Crisis, albeit in difficult circumstances as described above. “The win at Flemington on Saturday was very special,” Ray said. “It was a strange emotion. I didn’t know whether to cry or to punch the air with my fist! “It was most definitely the best win we have had as breeders. “Unfortunately, we don’t own him anymore, but we still have his two younger sibling colts. Darren Weir paid just $20,000 for Perpetual Crisis at the 2015 Inglis VOBIS Gold Sale and he (and other buyers) will get the chance to buy another Campling/Brindle/Oakford product at this year’s sale. Ray and Helen will be offering three yearlings at the 2017 VOBIS Gold Sale through Oakford including Leica Gossip’s Lucas Cranach colt. Leica Gossip had a Skilled colt last year and is now in foal to Swettenham based sire Toronado. Destiny was served when Dodging Bullets landed the $100,000 Swettenham Stud Championship Final (1700m) at Caulfield on Thursday. The Symon Wilde trained gelding is a son of former Swettenham sire Dash For Cash and was conceived, foaled and raised at the Nagambie nursery. He was bred by the Hance family’s North Road Bloodstock operation. The now 5yo was also part of the Swettenham consignment to the 2013 Inglis Melbourne Premier yearling sale making $42,000. “We always liked him although he didn’t show much before racing,” Wilde recalled as Craig Williams brought the winner back to scale. Raced by a partnership comprising Bill Whitehead, John Emerson, James Irvine, William Blackwell and John Matie, he has now earned $234,400 which includes VOBIS bonuses of $63,400. 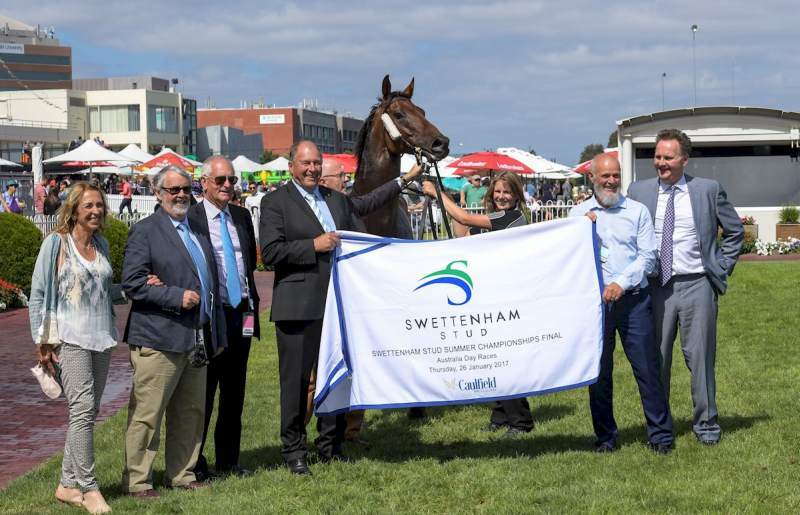 Dodging Bullets led home a Swettenham reunion on Australia Day with a narrow victory over fellow Warrnambool visitor Our Bottino. The runner-up is by former Swettenham sire Bianconi who died in February 2016. Dash For Cash sired the winner from Young Love (Danzero). She is a sister to Happy Zero (winner of Group 1 HK Queen’s Silver Jubilee Cup) and won races around the provincial circuit for Robert Hance and trainer Rick Hore-Lacy. Hance and his wife Gwenda operate under the North Road Bloodstock banner and they have bred several feature winners by Dash For Cash including Group 2 winner Chase The Rainbow, Listed winner Dandy Dollar and Tasmanian Sires Produce winner Pittenweem. Swettenham’s consignment for the 2017 Melbourne Premier consists of 38 yearlings with the majority for outside clients. Leading sires such as I Am Invincible are represented – his grey filly from Flemington stakes winner Members Joy is a standout. The draft also includes a dozen second-crop yearlings by Swettenham sire Americain (USA) including Lot 13, the half-brother to last year’s Group 2 Reisling Stakes winner French Fern. More detailed information on the submission is available on the TBA R&D Levy Proposal web page located at www.tbaus.com/levy. 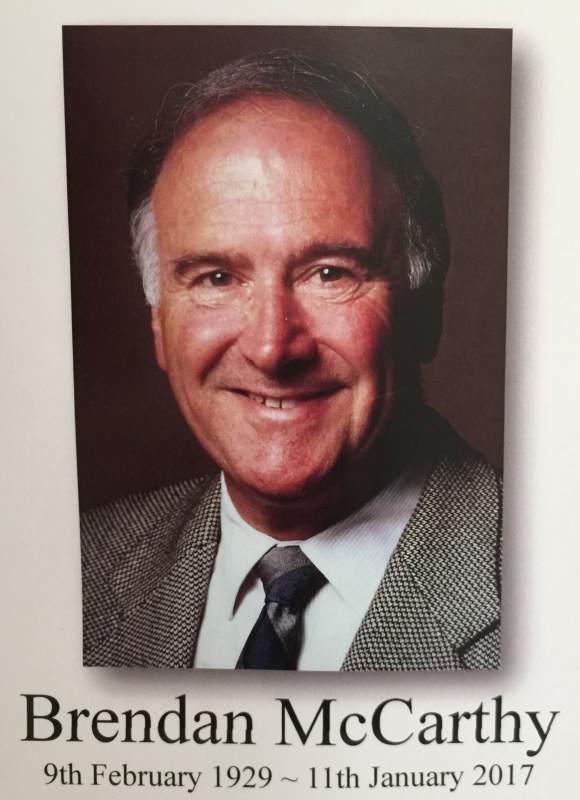 The life of Brendan McCarthy, a gentleman who made a big impression on Victoria’s racing and breeding scene, was celebrated at his funeral service last Tuesday. A large congregation farewelled the former Victorian Bloodhorse Breeders Association (now TBV) President and life member at the poignant event held at the Mother of God Catholic Church in Ivanhoe. It was entirely fitting that the turnout was big. After all, Brendan seemed to revel in big numbers. He was one of six children and he and his beloved wife Tess who he married in 1952 raised eight children. And at one time, Brendan had Victoria’s biggest band of broodmares not to mention a large horde of racing stock. Brendan’s love for horses began as a teenager in Kyneton, when he acted as the S.P. bookmaker amongst his fellow students at Marist Brothers College! It was not until 1958 that Brendan purchased his first horse, Just Treasure. Brendan and Tess’ initial equine property was at Alphington, just five kilometres from Brendan’s office at Collins Street. During this period, they acquired the fillies Rags To Riches (Ragtime) and Intricate (Showdown) who then went on to become two of Brendan’s favourite racehorses and who also held a special place as broodmares. 1971 marked the beginning of Brendan’s major entry into the breeding industry with the establishment of the 2000 acre Clearview Park Stud at Flowerdale. It would become home to up to six stallions and catering for the operation’s 500 odd breeding and racing stock. Clearview Park Stud stood stallions of the calibre of French-bred import Rare Pearl (Lyphard) who sired Melbourne stakes winners Bejilla, Pearl Prince, Rare Chance, Spanglet and Stockavion in the 1980s. Also stationed at the stud was Epsom Derby winner Snow Knight (Firestreak). In 1983 the McCarthy clan moved to Tallarook following the purchase of Landscape and the transfer of Clearview Park to this stunningly beautiful property on the Goulburn River. All family members were involved with Brendan in the running of the stud, especially Brendan Jnr (now a Caulfield based trainer), Gerard, Laurence and Daniel (now a Wangaratta based trainer). It was during this time that Brendan became President of the Victorian Bloodhorse Breeders Association. Ted Cockram was Vice President while Tim Stewart was Secretary. All three are now TBV Life members. The trio along with others including Doug Reid, Leigh Jordan and Les Benton were the drive behind the establishment of the Victorian Owners and Breeders Incentive Scheme (VOBIS). “McCarthy and Cockram had long lamented the lack of incentives for owners and breeders in Victoria, having closely studied those that were available in Europe and North America. After much research and study, they determined the model used in France was the most attractive and set about getting something similar implemented into Victoria. While they encountered roadblocks initially, McCarthy and Cockram eventually presented to the Victoria Racing Club and gaining the support of the then the governing body in Victoria was when things started to flow. Brendan proudly watched VOBIS continue to evolve into a scheme that now pays out to owners and breeders in excess of $10 million a year. It also now includes the $3.1 million VOBIS Gold Premier Race Series and the newly created $1.5 million VOBIS Sires scheme. Brendan Jnr said his father’s key role in the lobbying the VRC and State Government for the establishment of VOBIS demonstrated his attributes as a visionary. Following their involvement with the Breeders Association, both Brendan and Ted went on to be long-term committeemen at the Moonee Valley Racing Club. Brendan’s son Peter would follow in the footsteps of his father becoming Breeders Association President in 1993-94. Fittingly, he was also involved in the creation of VOBIS Extra and Super VOBIS during this time. Brendan Jnr and Daniel are active and successful trainers in Victoria. But perhaps the greatest legacy of Brendan McCarthy is not VOBIS or the terrific success of his children. It is how he lived his life. In the eulogy delivered by three of his children Peter, Mary and Daniel, they described him as a true gentleman, a man of integrity, deep faith and strong family values. Reproduced from Racing.com. By James Tzaferis. Racing has long been a sport for dreamers where millionaires and battlers share the limelight and thoroughbreds with million-dollar yearling price tags square off against hardy homebreds. This fact was never more evident than at The Valley on Saturday, where Victorian racing’s lovable ‘battler’ Darren Weir orchestrated one of the year’s most memorable fairy tales to date when Burning Front won the $130,000 VOBIS Gold Star (1500m). The gelding’s managing owner Justin Lovatt said the win, the 13th of Burning Front’s 42-start career, held additional significance given the trackside appearance of his 14-year-old son Lachlan, who has been battling an aggressive cancer over the latter part of 2016. The Lovatt family, as well as hundreds of friends and supporters, were trackside at a Committee Room tribute lunch for Lachie to watch the gelding salute in the lucrative leg of the VOBIS Gold Premier Race Series. “Lachie has been in the Royal Children’s Hospital since August last year and he’s just been given the all clear so we’ve thrown the chemotherapy key away and we’ve just got to bide the rest of the treatment out now,” an emotional Lovatt said. “We had a bit of a tribute lunch in the Committee Room today and we were very lucky that Burning Front was able to race on the same day. Lovatt bred the six-year-old son of Primus who, after his second consecutive VOBIS Gold Star win, took his earnings past $700,000 and praised the role of Weir and his Warrnambool-based training team in their careful management of Burning Front’s racing career. “I actually bred him, and I own mum (She’s A Knockout) and dad (Primus) as well so it’s just one of those fairy tale stories,” he said. 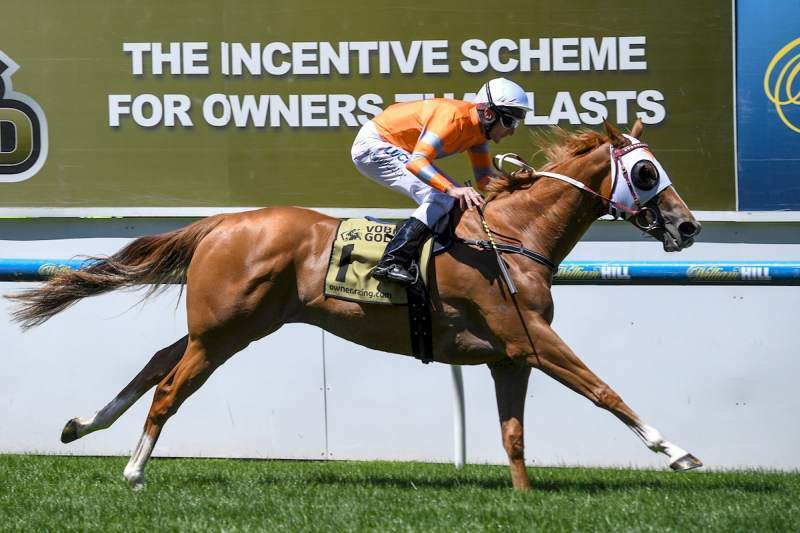 Weir, who has made the VOBIS Gold Star his own in recent years with Burning Front (2016 and 2017) and fellow VOBIS pin-up Trust In A Gust (2014), said he was thrilled he could play his part in the special day for connections. 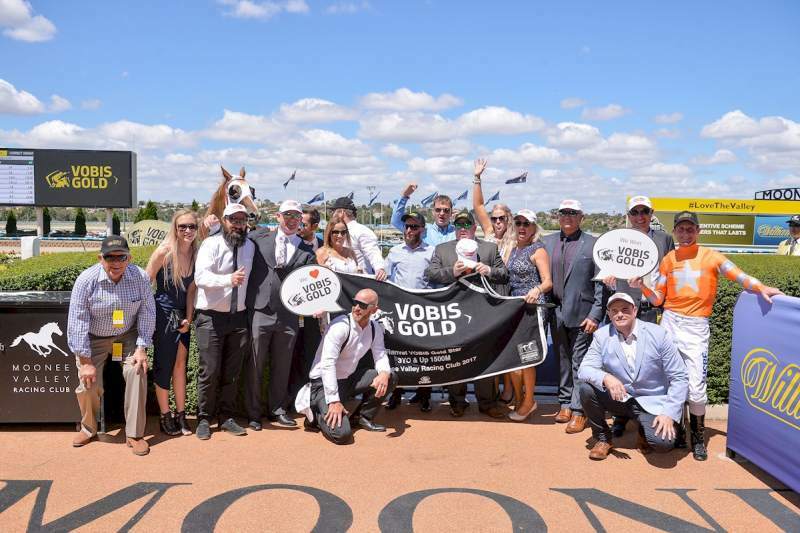 The VOBIS Gold Star (1500m) victory added to Burning Front’s success in the race 12 months ago, as well as his victory in the 2015 edition of the VOBIS Gold Bullion at Racing.com Park. “He’s got the ideal racing style and he’s just a great racehorse,” Weir said. She’s a Knockout (Kingston Rule) had a Written Tycoon yearling sell at last year’s Premier Sale for $130,000 to Malua Bloodstock/Next Level Bloodstock. She currently has a full brother by Primus as foot while she was covered by Chatswood’s Reward for Effort in October 2016. Stakes winning Primus (Flying Spur) was retired to the Chatswood Stud breeding barn in 2007. Justin Lovatt now stands him at Liverpool Farm in the Strathbogie Ranges. As well as Burning Front, he has sired last year’s Singapore Group 1 winner Laughing Gravy. 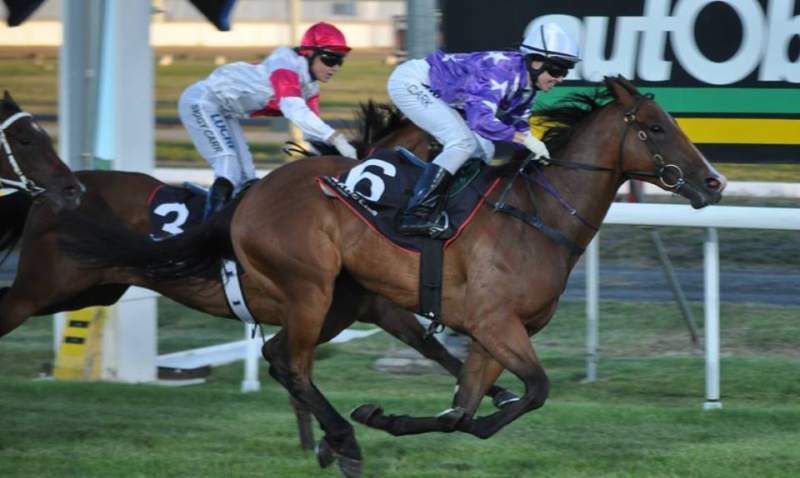 Squamosa two-year-old Derasa returned in big fashion at Launceston last Wednesday when she produced toughness and class and record emphatic victory in the $30,000 Ensign Lodge Alfa Bowl Stakes. Fittingly, Denise Martin’s Star Thoroughbreds own Derasa and also raced Squamosa during his brief, but exciting, racetrack career. 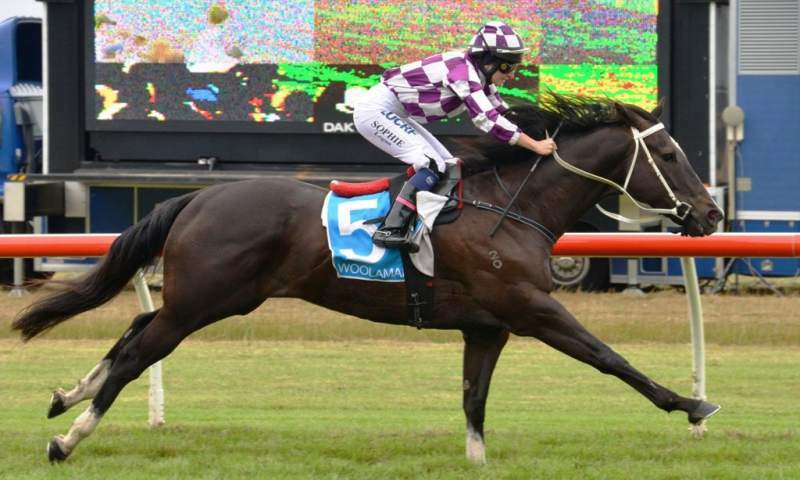 The Fairways Bloodstock (Nagambie) bred Derasa was a trial winner leading into her debut last year in early November, but was trapped wide over the unsuitable 800 metres and finished third. A renowned trainer of juveniles, Spreyton-based Barry Campbell immediately spelled the bay filly after her debut to further grow and mature. The spell has obviously benefited Derasa with last night’s win coming despite being forced to take a wide run. Apprentice jockey Raquel didn’t panic however, keeping her in a perfect rhythm to come three deep around the bend and fly home down the middle of the track. Derasa showed all the traits of her father when winning – speed, toughness and a will to win. This was evident through Squamosa’s 4-win, 7-start short race career, which included a neck second in one of the fastest ever run Group 1 Golden Roses. Winning trainer Barry Campbell was full of praise post race for the winning Squamosa two-year-old filly. “I was very impressed with this effort because she is probably only ninety per cent fit because she has two more tough races to contest this preparation,” Campbell said. “After she ran third on debut I tipped her out for two weeks at Armidale (stud) and when she came back to my stable she looked more like a colt than a filly. “She is a natural racehorse and very quick to learn and that’s always a bonus in a two-year-old. Derasa was bred by Ben Croft’s Fairways Bloodstock at Nagambie. She was knocked down for $39,000 at the 2016 Adelaide Magic Millions Yearling Sale to the bid of Star Thoroughbreds and well-regarded bloodstock agent Paul Willetts. The spitting image of her father Squamosa , Derasa is the first winner from Commands mare Jesting. Fairways Bloodstock will offer the current yearling from Jesting at the 2017 Adelaide Sale, a colt by another young and exciting Sun Stud sire in Fighting Sun (Northern Meteor). In addition, the 2017 Adelaide catalogue contains two well-related yearlings by Squamosa, lots 340 and 385. Squamosa stood last year at Sun Stud in Victoria for an advertised service fee of $6,600 (inc. GST). The powerful son of champion sire Not A Single Doubt covered 121 mares last breeding season, his biggest book of his four seasons at stud. The confidence in the young sire certainly augurs well for the future. Own the sire, raced the dam and now bred the talented son! No one could deny Ralph Zito the ‘luck’ in having a very handy galloper in the form of fiver-year-old Leodoro. Of course, Ralph doesn’t merely put it down to luck. He is a devoted student of pedigrees undertaking careful examinations prior to making breeding decisions. Ralph and his family have not just bred the Mick Kent trained gelding who has won two of his past three. They, perhaps unusually, bred, raced and still own Leodoro’s sire Jayemzed (Lion Cavern) not to forget racing and owning his dam White Gold (Colombia). Beautifully handled by our in-form apprentice Ethan Brown, Leodoro travelled well behind the leaders along the rails and stayed there into the straight before winning a head bobbing challenge. For the Zitos, it was also the first mainland metropolitan city win for their Maldon based stallion Jayemzed. 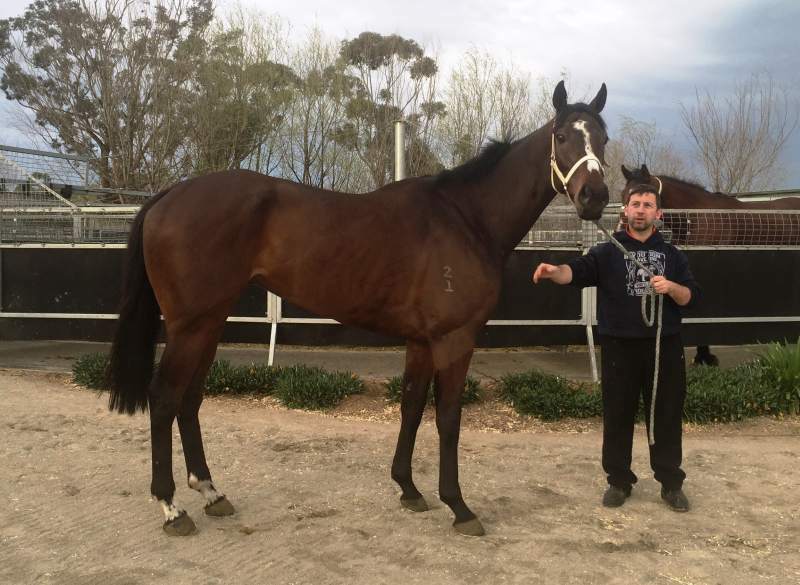 Now based at Maldon’s Darnik Park having initially stood in Tasmania, the Group placed Jayemzed has had just eight runners – four of whom are winners with another two placegetters. Until Wednesday the three times winner Bee Jay Zed (also bred by the Zito family) had been his highest prize money earner but with his fourth win from just 13 starts, Leodoro has now overtaken him with over $72,000 in stakes. Michael Kent is confident that the best is still to come from Leodoro. “He is a horse who has always shown us a lot on the track,” he said, adding that the sparingly raced bay has taken a while to figure things out. Ralph was happy to send his two times winning Colombia mare White Gold (a full sister to the stakes placed dual city winner Oronero) to Jayemzed four years running. 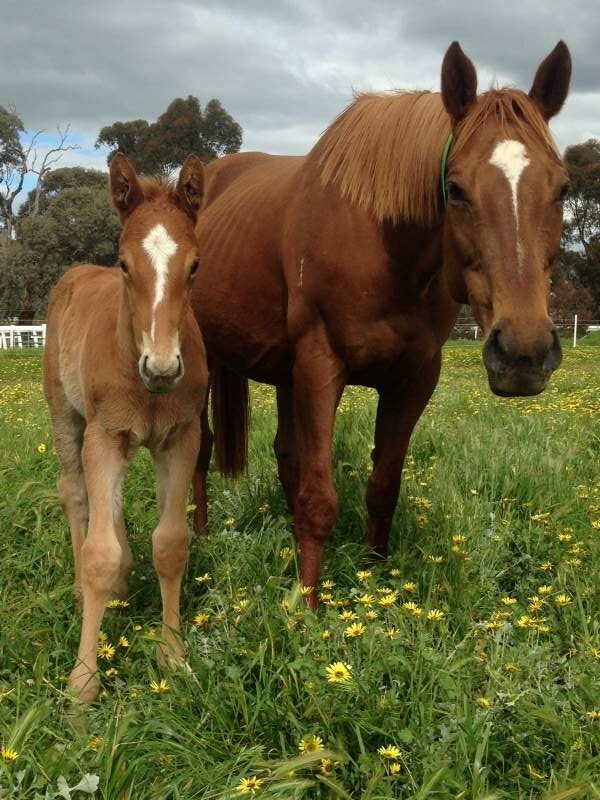 Three foals have resulted from those matings, Leodoro the first – the second sold to China whilst the third, the three-year-old Gold Phoenix is close to debuting in Tasmania having won a recent trial. Ralph and his fellow owners have been happy to give Leodoro the time he has needed, noting that from birth he looked the type to take a while to mature. But, having had a good feeling about the Jayemzed – White Gold cross – Ralph was always confident and pedigree was one of the first things he talked about after his horse’s first city win. “It was that Somethingroyal influence kicking in!” he laughed, noting that whilst Jayemzed is bred on a 4 x 6 cross of that influential matriarch via her legendary son Secretariat and her grandson Super Gray, White Gold is bred on a 5 x 5 cross of her other prolific son Sir Gaylord. White Gold is also interestingly bred with her sire Colombia (full brother to Octagonal) and dam L’Anello hailing from the same family. The yearling half-sister (by Needs Further) has been catalogued for the Magic Millions Tasmanian Sale. There is also another Needs Further yearling at the sale which is out of a half sister to Leodoro. The Victorian breeding industry has once again played a role in developing a Group 1 Hong Kong (international Listed) winner with Street Boss four-year-old Rapper Dragon winning the Hong Kong Classic Mile at Sha Tin. 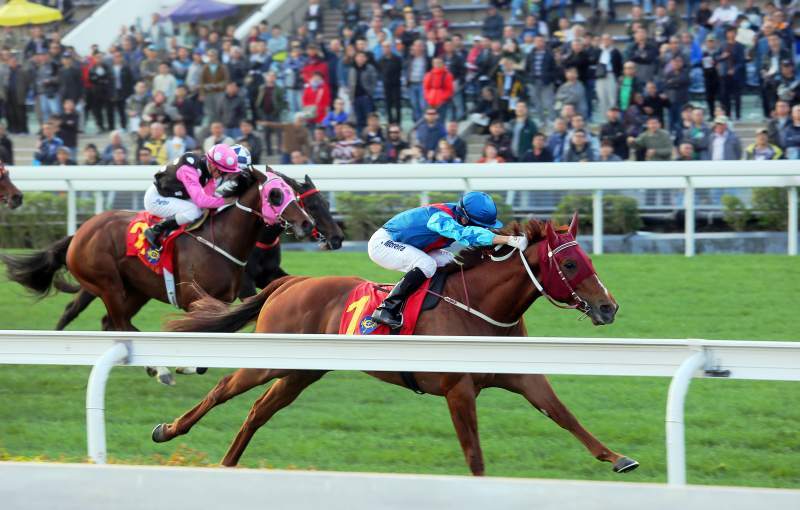 The John Moore trained gelding took command with just over a furlong to run as he drew off to a comfortable two-length victory in the first leg of the Hong Kong Triple Crown. “He seems like something special…I was always comfortable, all the way through the race,” said champion jockey Joao Moreira. Rapper Dragon is now expected to line up in the Hong Kong Classic Cup followed by the prestigious Hong Kong Derby over 2000 metres in March. Last year, Briarwood Farm raised Sun Jewellery won the first two legs of the HK Group 1 Triple Crown. On Sunday, Rapper Dragon provided his Darley Northwood based shuttle sire Street Boss with his 26th stakes winner. This sire record includes five Group 1 winners with the Gilgai Farm bred The Quarterback among them. On Saturday, Street Boss’ five-year-old son Holy Boss became the sire’s 25th stakes winner, taking out the Duncan F. Kenner Stakes at Fair Grounds. Bred in Australia by Gooree Park, Rapper Dragon is out of Swing Dance, by Danehill Dancer. Swing Dance is a full-sister to the Stakes-winning Turf Express, and a half-sister to Amanpour, winner of the Group 1 Queen of the Turf Stakes. Group One-placed when in training with Gai Waterhouse in Australia where he raced as Street Rapper, Rapper Dragon has now won six of his 14 career starts for a stake earnings of more than AU$$2.2 million. Street Boss stood at Darley Northwood for a fee of $27,500 in the 2016 breeding season and covered 103 mares including Rapper Dragon’s dam Swing Dance. Inglis has catalogued 17 yearlings by Street Boss for the upcoming 2017 Inglis Premier Sale. Victorian premium boutique breeder Morning Rise Stud enjoyed some successful southern exposure on Sunday. The Red Hill breeding operation of Robert McClure bred three year-old So You Think gelding Northwest Passage who won Listed $100,000 Hobart Guineas by a whopping seven and a half lengths. Northwest Passage was passed in at the 2015 Inglis Australian Easter Yearling Sale and is the second winner for Group 2 placed Danevade, a sibling to Group 2 winner Shania Dane, HK Classic Mile Winner Scintillation and stakes-winner Risk Aversion. “We took some very good horses up to Easter that year. (Group Two placed) So Si Bon was one, California Nike another and, now, Northwest Passage … all of them (now) winners,” said McClure. 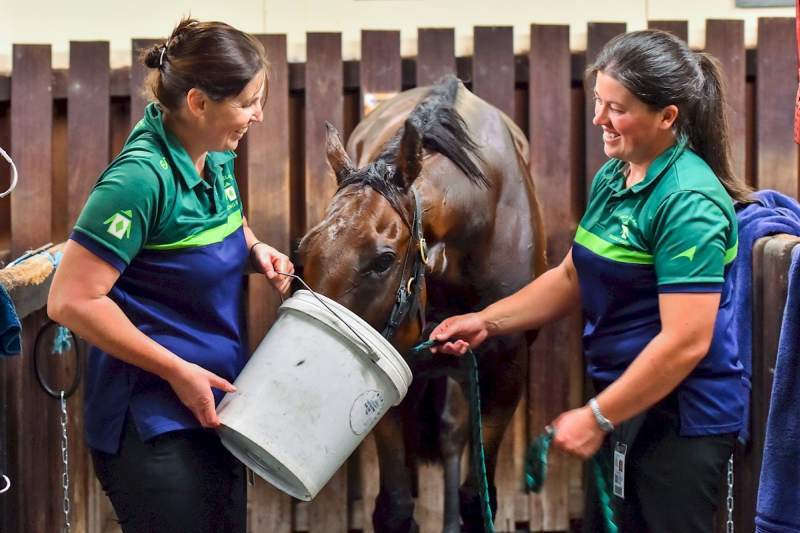 “Unfortunately, Northwest Passage was passed in due to some small x-ray issues, but we brought him back home for a couple of months and Gai Waterhouse then rang me up to ask about him and ended up buying the horse. “He’s certainly turning out to be worth the wait. That was a very good win in Hobart and hopefully there’s a lot more in store. The Gai Waterhouse and Adrian Bott stable have a high opinion of Northwest Passage, so there was no surprise when he came out and blitzed his rivals. Things have obviously moved on since then and the operation a great success! McClure’s Morning Rise Stud is a 77 acre property situated in a lush valley overlooking beautiful Port Phillip Bay. They breed out of a small number of high quality broodmares including Group 1 winning Anabandana as well as stakes winners Fontein Ruby, Rezoned, Jazz Song, Bliss Street and Sister Havana among others. They previously bred from triple Group 1 winner Yosei until selling her at the 2016 Magic Millions National Broodmare Sale for $580,000 to Victoria’s own Sun Stud. It must have been just like winning Horse Lotto for Henning (Keep The Faith) when he was rescued on the way to the knackery by Jim Cerchi jnr last year. The Coronet Bay trainer got to work resurrecting Henning and he earned a winter campaign in North Queensland following a Mornington victory last week. “I know where I want to be in winter and it’s not Melbourne,” Cerchi declared. Henning (Keep The Faith) will be among them after an unbeaten start to the year. It has been an amazing turnaround for the 6yo gelding who had gone through a couple of stables before ending up at death’s door. 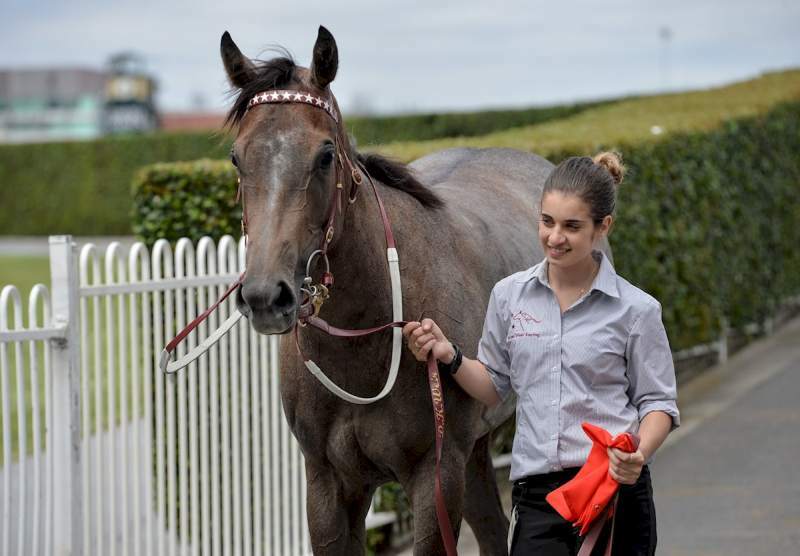 “We were lucky Rachel Morgan spotted him at a stock sale in Echuca,” Cerchi recalled. Henning was bred by well-known Mildura businessman Bill Lanyon who died in September 2013. The Lanyon family (including Ross, a past president of Country Racing Victoria) breed and race under the ‘Clay Hero’ banner after their 1989 Oakleigh Plate winner. He was raised at Grange Thoroughbreds in the Goulburn Valley. Greta West Stud sire Keep The Faith sired him from the mare Aberdeen Rose (Clay Hero). She was a talented mare for Lanyon winning at Flemington, Caulfield and Sandown. Her best foal has been 2011 Herbert Power Stakes winner Shewan (Blevic). 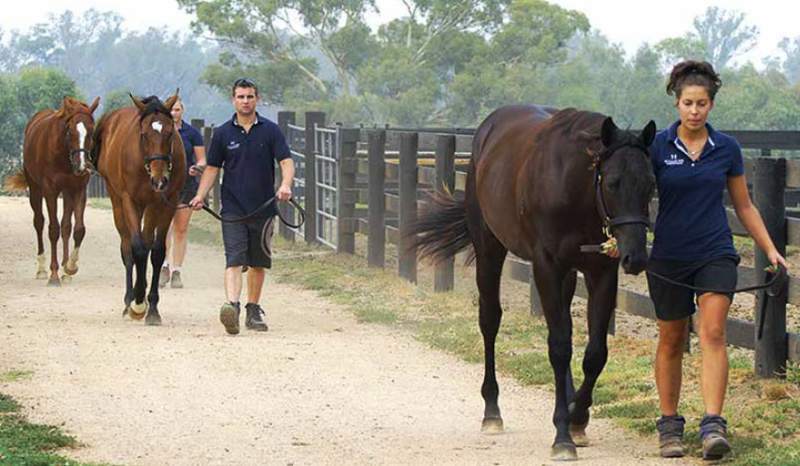 One of Victoria’s up-and-coming breeding farms, Hillside Thoroughbreds, is built on the smart business acumen of an enthusiastic owner and the astute knowledge of one of Australia’s leading bloodstock agents. Danny Power reports for Inside Racing. Late in 2014, noted bloodstock agent Peter Ford took over the business and bloodstock management of Hillside Thoroughbreds, a picturesque property in Victoria’s Nagambie district, a short barrel roll from the historic Chateau Tabilk winery. One of the yearling fillies on the farm caught his eye from day one, a brown daughter of Victoria Derby winner Monaco Consul from a mare Ford had bought for Hillside’s owners Peter and Areti Arvanitis. The filly’s dam, Sicile, was bred in France by the legendary trainer Alec Head. Ford bought her at a Patinack Farm dispersal sale on the Gold Coast for $41,000 in 2012—with a colt foal at foot by Lope de Vega. Named Starsky, it has won in Singapore. The mare had been covered by Monaco Consul only a few days before the sale, so it was unsure if she was in foal or not. Ford had the mission to sell the Monaco Consul filly through Hillside’s first home-bred draft of yearlings at the 2015 Inglis Melbourne Premier Sale, but he knew it wasn’t going to be easy because she wasn’t due through the ring until the final hour of the four-day sale, and she was by a staying sire that wouldn’t have been high on the list of most commercial buyers. Ford tried to steer as many prospective buyers into the attractive and athletic filly. One, Caulfield trainer John Salanitri, liked her and indicated he’d be bidding. Salanitri thought he had the filly at $45,000 before he was gazumped by a late $50,000 bid from agent John Foote, acting for trainer Darren Weir. That filly, named Tiamo Grace, gave Ford and the stud owners an enormous thrill last spring when, at only her fifth start, she won the Group 2 Wakeful Stakes (2000m) at Flemington. It was a tremendous boost for the fledgling farm. 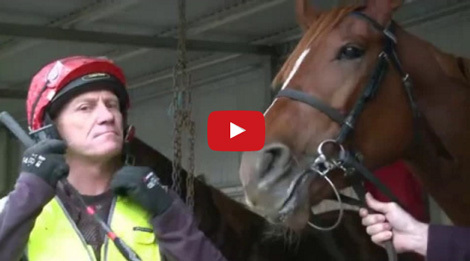 The only person not smiling was Salanitri—plus the stable cat if he strayed too close to the trainer’s boot. 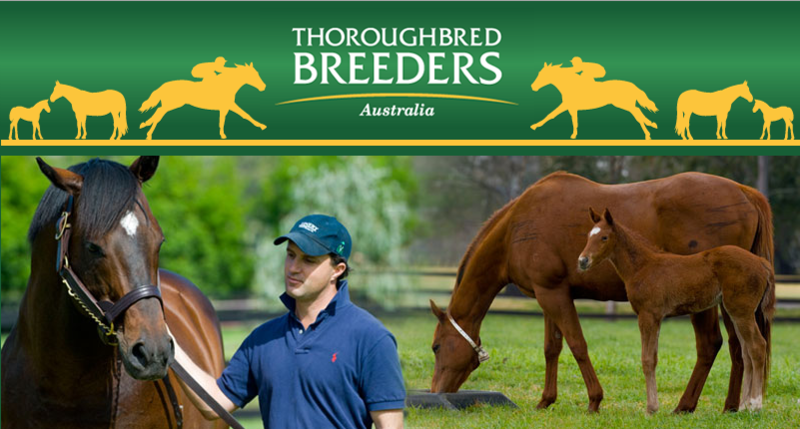 Hillside Thoroughbreds was established in 2012. Peter Arvanitis, who has a background in transport and property development, had built his wealth as the founder of aged care operator, Estia Health, in 1996. Arvanitis has had a long- standing love affair with horse racing, in particular a desire to be involved in the breeding side of the industry. Hillside Thoroughbred fulfilled his dream and became his passion. His mantra to build his thoroughbred business is based on three criteria—location, facilities and team. It was logical that Arvanitis would source his farm at the centre of Victoria’s prominent thoroughbred breeding region near Nagambie in the state’s north-east. Location—tick. The 95ha farm—formerly Mike Becker’s Independent Stallions—is on prime Goulburn River land. It features 14 large paddocks, nine spelling paddocks, foaling yards, yearling barn, mare and foal barn, veterinary area, horse walker and staff accommodation. Facilities— tick. The final need was finding the professional staff, and that’s where Ford’s involvement increased from buying agent to Hillside’s manager. Team—tick. Ford came with a long history in racing and breeding—his father Frank Ford was a legendary and ground-breaking bloodstock agent—and an impressive CV that includes buying many high- class racehorses and, of course, Helsinge*, the dam of Black Caviar. “There are no gold taps, but it’s a good, functional property with all the right facilities,” Ford said. Last year was ground-breaking for Hillside Thoroughbreds. 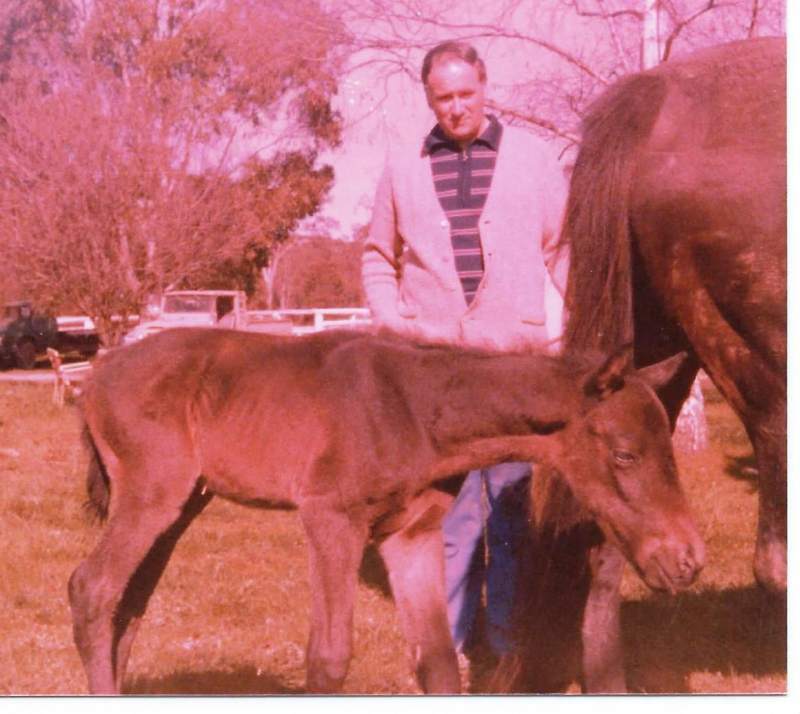 Apart from Tiamo Grace, the farm foaled down and raised top West Australian filly Whispering Brook, Robbie Griffiths’ smart juvenile filly Areti (raced by the Arvanitis) and the promising Classic Diva, also with Griffiths. “I want to promote the fact we can produce quality fillies off this farm, which has become important because our best yearlings in our 2017 draft to sell in Melbourne are fillies,” Ford said. Hillside Thoroughbreds has a draft of seven yearlings in Session 1 of February’s Inglis Melbourne Premier Sale at Oaklands Junction and two—a colt and a filly by Sepoy— in Session 2. All the yearlings are Super VOBIS nominated. It’s an eclectic mix of stallions featuring fillies by star sires Snitzel and Medaglia d’Oro and three youngsters by exciting first-season stallions Dundeel (filly), Camelot (filly) and Epaulette (colt). However, it’s a filly by So You Think that will command most attention. Lot 244, she is a three- quarter sister to Tiamo Grace, whose sire Monaco Consul is by So You Think’s sire High Chaparral. It’s a family that had a big impact in the spring. 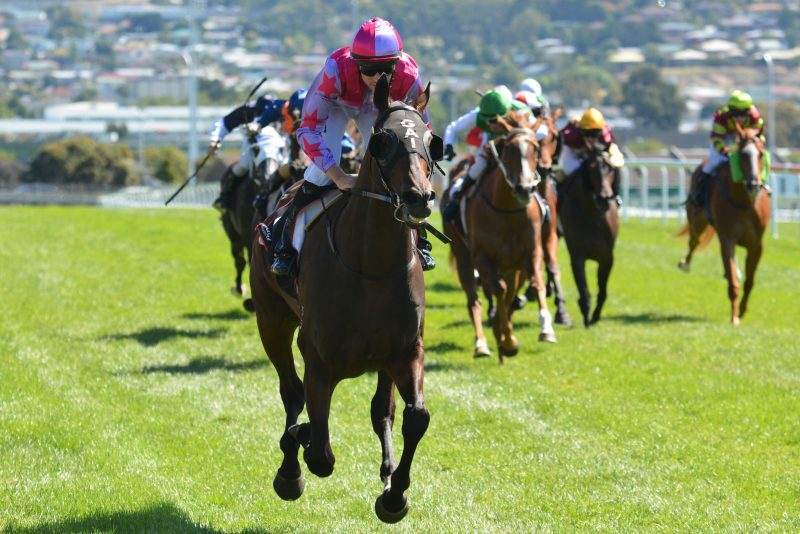 Not only did Tiamo Grace impressively win the Wakeful Stakes on Derby day at Flemington, but also the feature mares’ race on the program, the Group 1 Myer Classic (1600m), was won by I Am A Star (by I Am Invincible), a close relation to Tiamo Grace. Tiamo Grace’s grand-dam Spenderella (by Common Grounds) also is the dam of Star Band, the dam of I Am A Star. This is a famous family founded by the US Hall of Fame mare Franfreluche (by Northern Dancer) that also includes champion Australian stallions Flying Spur and Encosta De Lago. He describes the Medaglia d’Oro-Classic Music filly (lot 421) as an “outstanding yearling” and the Dundeel- Cinque Cento filly (lot 137) as “from a Group-winning mare and just like mum”. Ford said he spends two or three days a week at Hillside. He enjoys the experience of being able to put his breeding theories into practice, particularly in stallion selection. Although he admits to being a breeder and agent who concentrates more on “type” than pedigree, he has developed some of his own pedigree matching theories that seem to be working. Following the employment of Hamish Chugg (ex Arrowfield Stud) as farm manager at Hillside, Ford has formed a partnership with Peter Buttress of Mayfield Thoroughbreds, at Hilldene near Nagambie, which allows him to conduct his own business in buying and selling horses. “Apart from the Hillside yearlings at Melbourne, I will have four of my own yearlings selling through Mayfield’s draft,” he said. The Inglis Premier Yearling Sale is held at Inglis’ sales complex at Oaklands Junction from Sunday, February 26 to Wednesday, March 1. Reproduced from Inside Racing magazine February 2017 edition (published by Slattery Media). 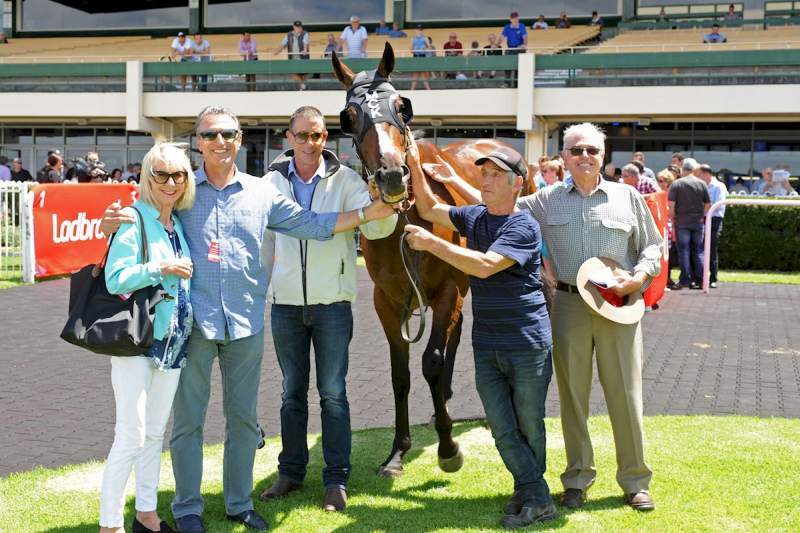 John Richards was very impressed with the victory of his Briarwood Farm bred filly, Wheal Leisure, in Saturday’s Metcash Handicap (2040m) at Moonee Valley … and, why not. After all, it was only her third start (second win) and it’s a big step up to a mile and a quarter this early on. 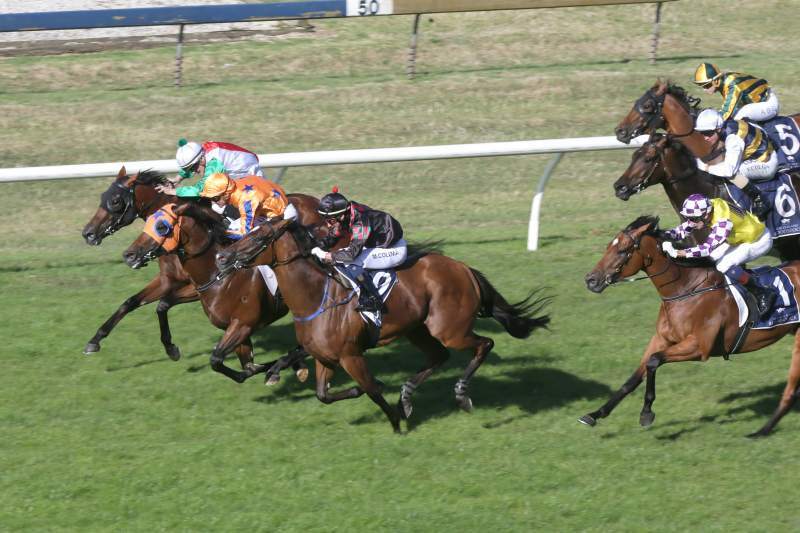 It will be an even bigger leap for Wheal Leisure’s next assignment as she prepares to cross the Bass Strait and take on the Apple Isle’s finest in the Listed Tasmanian Oaks (2100m) at Launceston on 19 February. “I really liked the way she got to the line on Saturday,” Richards enthused. “It’s only very early days but if she comes through the Tassie Oaks well, there’s always the options of the Oaks in Adelaide and Sydney too. Richards, a successful Victorian businessman, TBV breeder member and part-owner of 2015 Melbourne Cup winner, Prince of Penzance, secured Wheal Leisure from the 2015 Inglis Melbourne Premier Yearling Sale for just $22,000 and placed the horse with young Englishman, Archie Alexander. 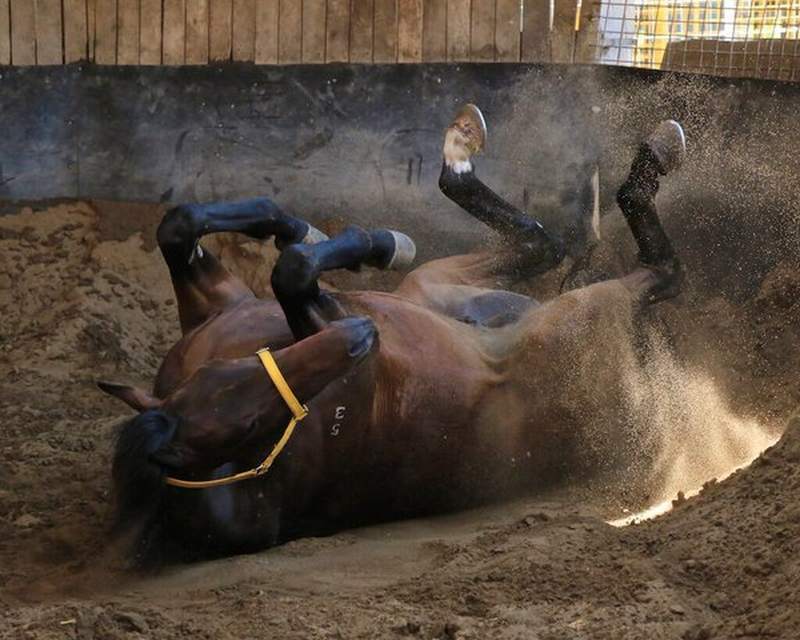 “I have most of my horses with Darren Weir, but Archie shifted to Ballarat and he’s very professional. Got a great work ethic,” Richards adds. A daughter of the former Emirates Park Victoria stallion, Artie Schiller (34 stakes winners including Flying Artie), Wheal Leisure is out of the Encosta de Lago mare, Sadiya. Bred by Briarwood Farm’s Lisa and Gavin McMaster, Wheal Leisure is a granddaughter of the Listed Cranbourne Cup winner and Caulfield Cup runner up, Lisa’s Game. “I’m not surprised Wheal Leisure is getting over a bit of distance this early,” Lisa McMaster points out. If McMaster is disappointed at selling Wheal Leisure as a yearling, she’s doing a good job of hiding it. “We normally race the ones we breed but we were just getting too many and so decided to put Wheal Leisure through the ring. What’s that saying? ‘You always sell the one that’s good’,” McMaster says with a laugh. Based at Cora Lynn, near the Pakenham racecourse, McMaster still has Sadiya though and will race her current 2YO, Temple of Bel (by Bel Esprit), who is now in work with Henry Dwyer at Caulfield and, albeit unraced, is “showing some promise”. HOOFNOTE: Wheal Leisure? John Richards claims Cornish ancestry and is a great fan of the TV series Poldark. Wheal Leisure is named after a mine which features in Poldark and was indeed a functioning mine: shut down in 1893 but still a major tourist attraction. A colt by Darley Northwood shuttle sire Brazen Beau has arrived safely in the United Kingdom. This first reported northern hemisphere foal by Champion sprinter Brazen Beau arrived at Kirtlington Stud on 15 January. 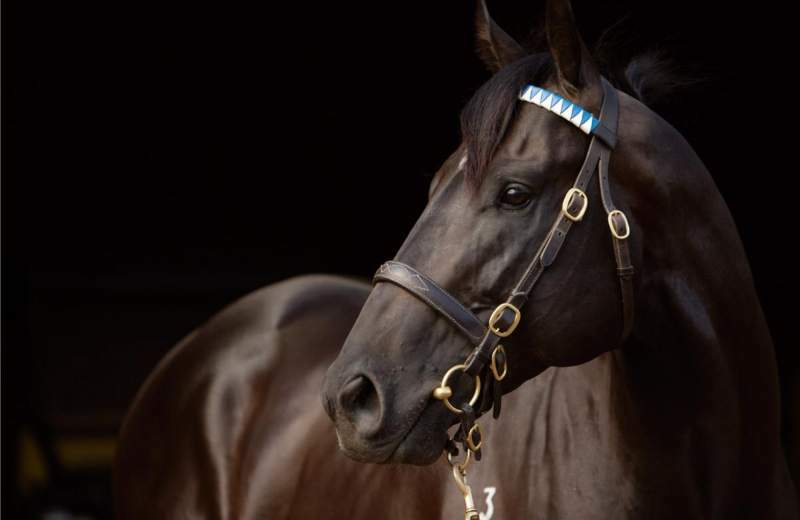 Breeders around Australia foaled down the first of the Southern Hemisphere foals by Brazen Beau last year with reports of fantastic types coming from all corners. Brazen Beau was outstanding on the racecourse, taking the Group 2 Champagne Classic before landing the Group 1 Coolmore Stud Stakes at Flemington as a three year old. He then took on and beat the older horses in the Group 1 Newmarket Handicap. Brazen Beau also travelled to Europe during his illustrious racing career and finished a very creditable second in the Group 1 Diamond Jubilee Stakes at Royal Ascot, beaten just half a length. The sun was hot and so were the results for Victorian vendors and breeders at last week’s Magic Millions Gold Coast Yearling Sale. Victorian vendors achieved an extraordinary 96% clearance rate– which bettered the overall sale clearance rate of 87%. $650,000 paid by James Harron Bloodstock for a son of Written Tycoon (out of Pearl Goddess). This is believed to be the highest price paid for a yearling at Magic Millions sired by an active Victorian sire. Musk Creek Farm of Flinders had a highly successful sale leading the Victorian vendors with an average sale price across 12 lots of $212,917. Musk Creek’s sales included a Sebring-Footprint colt sold to a Hong Kong buyer for $600,000. Rosemont Stud sold the highest priced filly of the Victorian vendors with its homebred Zoustar-Karalli yearling selling to Clinton McDonald Racing for $400,000. Musk Creek’s Dundeel – Cerberus Gal colt selling for $500,000 to Spendthrift after he was purchased as a weanling for $240,000. Kulani Park of Merricks North bought their Zoustar – Permaiscuous colt for $100,000 at the weanling sales and then sold him for $375,000 on the Gold Coast. Victorian owners and trainers bought the largest number of VOBIS nominated yearlings, but notably there was strong interest also from Hong Kong, Singapore, Macau and China buyers for Victorian bred product. On the buying side, a number of Victorian breeders were prominent once again. Sun Bloodstock (5 yearling colts) and Spendthrift Australia (3 yearling colts) both bought well-bred colts with no doubt an eye on a possible stud career down the track. 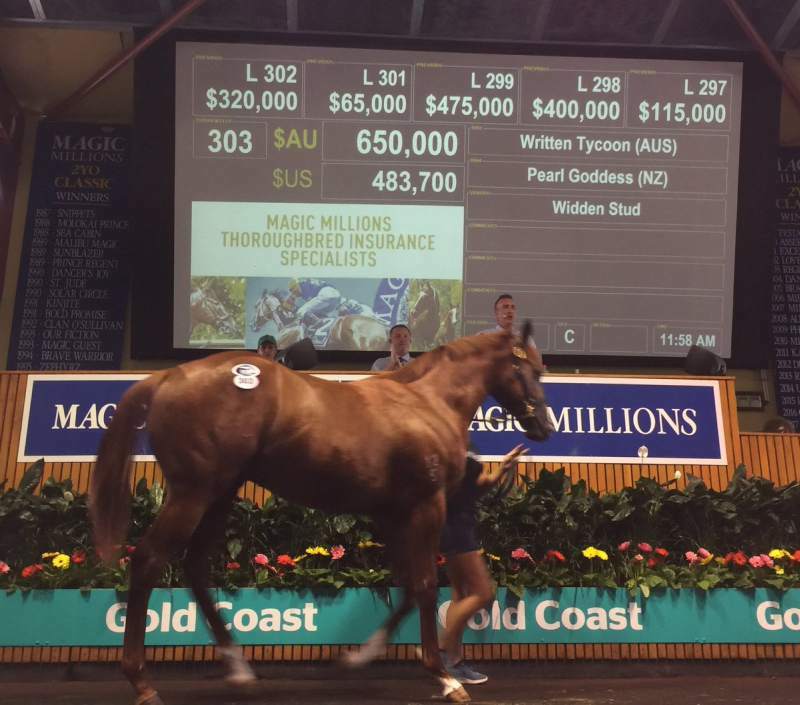 Other Victorian breeders including Murray Thoroughbreds, RIFA Mustang, Yu Long Investments, Baystone Farm and Noorilim Park were also significant buyers on the Gold Coast. A yearling’s appearance in the sales ring represents the culmination of two years’ work by breeders, owners, bloodstock advisors, veterinarians, and sales agents. But the final hammer price is also indicative of success for a group of often-overlooked people: those at the end of the horse’s shank. For farm managers, foaling and assistant managers, and sale grooms, a polished sale yearling is months of long work days in bitter cold or stifling heat. A final price is a reflection on blistered toes from miles of hand-walking and bruised arms from playful foal teeth. A job well done in this case requires not just hard work but good luck, and often, an emotional investment which can feel just as heavy as a financial investment. Anyone standing by the exit ramp at the Magic Millions Gold Coast Yearling Sale in Australia got a reminder of that this week as Jamee Ryder led Hip 27 out of the ring. The chestnut colt by Sebring out of Redoute’s Choice mare Footprint had brought 600,000 AUD ($447,720), selling to Little Kwok Hing Hung/Bahen Bloodstock of Hong Kong and becoming the top offering early in the sale’s first session. 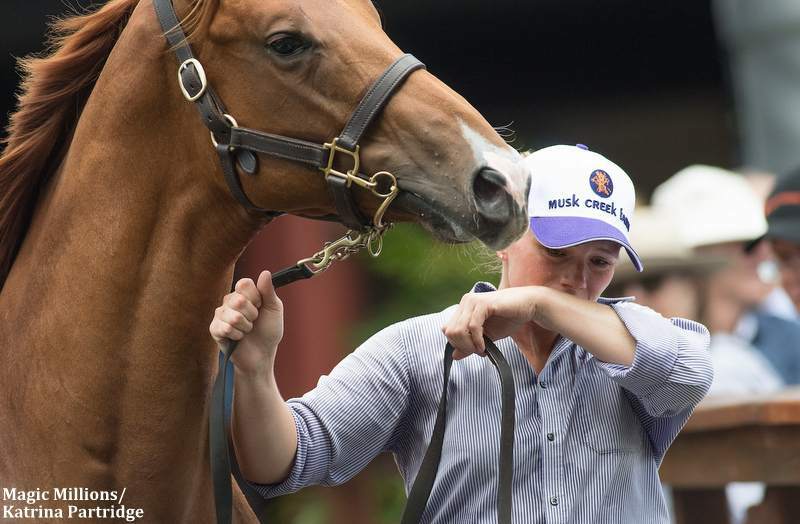 Photographer Katrina Partridge was positioned at the bottom of the ramp to catch images of horses in the seconds after sale, and caught Ryder wiping away a tear. “It happened so fast,” Ryder said. “I heard the bidspotters calling from six different directions, and I look up and [the price is] 525,000. And at 600,000, I was just overwhelmed. And he deserved it. 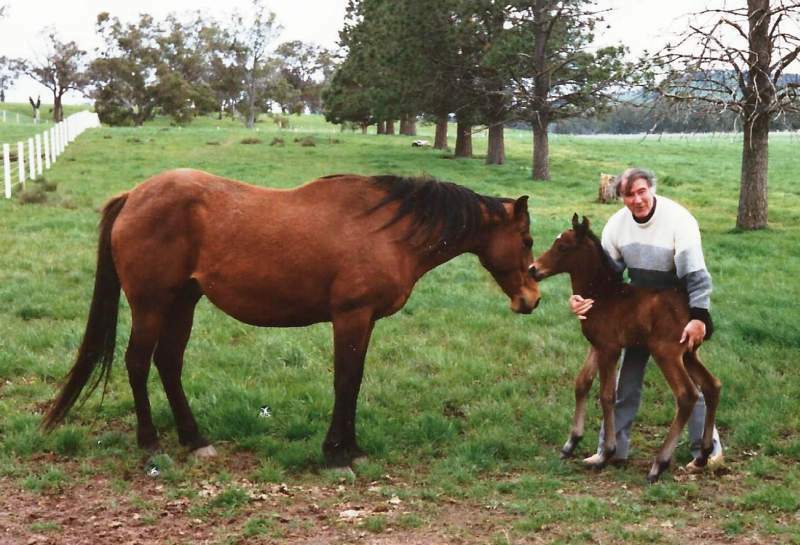 Ryder is assistant farm manager at Musk Creek Farm in Flinders, Victoria, which consigned the colt, and she remembers the first months in 2015 after he arrived with his dam. Musk Creek foals its mares in the Hunter Valley, about 12 hours away. When the Footprint colt made the trip home, he was sickly and small for his age. “He wasn’t in the best state and it took us a while to get him right,” said Ryder, who remembered the foal having a gastrointestinal illness and struggling to keep weight. Once the colt started growing, Ryder quickly found he was her favourite. If she had some time after returning to the farm for evening feeding and night check, his was the stall she’d slip into to give him extra head scratches or to take selfies with him. 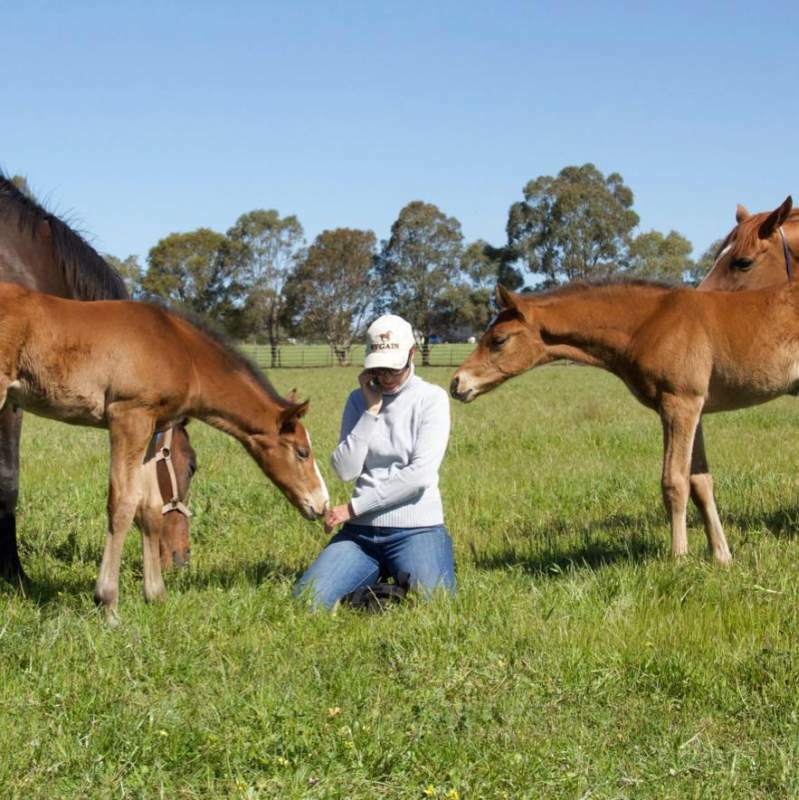 She cared for the colt and his pasture mates from weaning to sales prep and made the journey (19 hours by car) from the farm to Magic Millions to show him on the sales grounds. Sales preparation for Musk Creek involves a lot of ground work beyond the typical program to better set up older horses for early tack training. All this means she, like many farm workers, learns the nuance of each horse’s movements and moods. The Footprint colt was easygoing from the beginning, like his siblings before him, and polite enough Ryder believes he’ll be more likely to make a stallion upon retirement because his temperament won’t require him to be gelded early – which is good, since she heard buyers mention they thought of him as an eventual breeding prospect. She suspects the success of group winner and Hong Kong runner Lucky Bubbles, also an Australian-born son of Sebring, helped the Footprint colt. Ryder, 28, has been working on stud farms since she was in high school, when she made up her mind to translate her love of animals into a paid profession. Now trained as a veterinary nurse, Ryder has been at Musk Creek for four and a half years and feels she is just where she belongs. So how many hours is her work week? “You don’t really count after a while,” she said. In the end, the colt’s price was overtaken by a session topper of 900,000, and another yearling that fetched 700,000, but it didn’t matter to Ryder. She’s still proud, even if the drop of the hammer was slightly bittersweet. “It is hard to see them go,” she said.